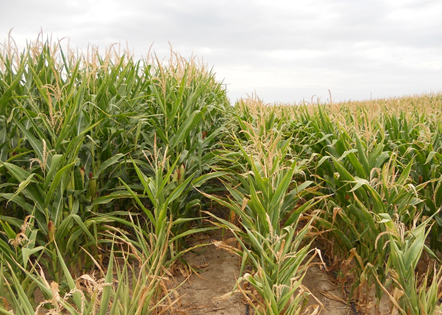 The USDA-Agricultural Research Service carried out an experiment on water productivity in response to seasonal timing of irrigation of maize (Zea mays L.) at the Limited Irrigation Research Farm (LIRF) facility in northeastern Colorado (40°26’ N, 104°38’ W) starting in 2012. Twelve treatments involved different water availability targeted at specific growth-stages. This dataset includes data from the first two years, which were complete years with intact treatments. Data includes canopy growth and development (canopy height, canopy cover and LAI), irrigation, precipitation, and soil water storage measured periodically through the season; daily estimates of crop evapotranspiration; and seasonal measurement of crop water use, harvest index and crop yield. Hourly and daily weather data are also provided from the CoAgMET, Colorado’s network of meteorological information (https://coagmet.colostate.edu/ ; GLY04 station). Additional soil data can be found in a previous dataset (USDA-ARS Colorado Maize Water Productivity Dataset 2008-2011) also available from the Ag Data Commons. This previous dataset included six targeted treatments that were generally uniform through the season. This new dataset can be used to further validate and refine maize crop models. The data are presented in a spreadsheet format in individual sheets within one workbook. The first sheet in the work book provides a list of data descriptions. Two sheets (one sheet for each of the two years) provide the hourly weather data, with the exception of the precipitation data, which is included in the sheet with daily data per treatment. The weather data is from a weather station on site. Another sheet provides plot level data (harvest index, yield, annual ET, maximum LAI, stand density, total aboveground biomass) taken annually by plot (four plots per treatment). Another sheet provides LAI measured four times over each season per plot. The final sheet provides daily data per treatment over each season, including data needed to compute daily water balance. This sheet has LAI, crop growth stage, plant height, estimated root depth, interpolated canopy cover, ET coefficients, precipitation, and estimated deep percolation, evaporation, and soil water deficit at four soil depths. Primary use is to improve or validate agricultural crop (maize) models. Limitations are noted in the dataset files. Data is from field/plot scale field research. Comas, L. H., Trout, T. J., Banks, G. T., DeJonge, K. C., Zhang, H., & Gleason, S. M. (2018). USDA-ARS Colorado maize growth and development, yield and water-use under strategic timing of irrigation, 2012-2013. Data in Brief. Comas L., Trout T., DeJonge K., Zhang H., & Gleason S. (2018). Water productivity under strategic growth stage-based deficit irrigation in maize. Agricultural Water Management. DeJonge, K., Taghvaeian, S., Trout, T., & Comas, L. (2015). Comparison of canopy temperature-based water stress indices for maize. Agricultural Water Management, 156, 51-62. Fang, Q., Ma, L., Trout, T., Comas, L., DeJonge, K., & Ahuja, L. et al. (2017). Modeling N Concentration and Uptake for Maize Hybrids under Growth Stage-Based Deficit Irrigations. Transactions Of The ASABE, 60(6), 2067-2081. Han, M., Zhang, H., DeJonge, K., Comas, L., & Trout, T. (2016). Estimating maize water stress by standard deviation of canopy temperature in thermal imagery. Agricultural Water Management, 177, 400-409. Kullberg, E., DeJonge, K., & Chávez, J. (2017). Evaluation of thermal remote sensing indices to estimate crop evapotranspiration coefficients. Agricultural Water Management, 179, 64-73. Ma, L., Ahuja, L., Trout, T., Nolan, B., & Malone, R. (2016). Simulating Maize Yield and Biomass with Spatial Variability of Soil Field Capacity. Agronomy Journal, 108(1), 171. Ma, L., Ahuja, L., Nolan, B., Malone, R., Trout, T., & Qi, Z. (2012). Root Zone Water Quality Model (RZWQM2): Model Use, Calibration, and Validation. Transactions Of The ASABE, 55(4), 1425-1446. Manning, D., Lurbé, S., Comas, L., Trout, T., Flynn, N., & Fonte, S. (2018). Economic viability of deficit irrigation in the Western US. Agricultural Water Management, 196, 114-123. Qi Z., Ma L., Bausch W., Trout T., Ahuja L., Flerchinger G., & Fang Q. (2016). Simulating Maize Production, Water and Surface Energy Balance, Canopy Temperature, and Water Stress under Full and Deficit Irrigation. Transactions Of The ASABE, 59(2), 623-633. Trout, T., & Bausch, W. (2017). USDA-ARS Colorado maize water productivity data set. Irrigation Science, 35(3), 241-249. Han, M., Zhang, H., DeJonge, K., Comas, L., & Gleason, S. (2018). Comparison of three crop water stress index models with sap flow measurements in maize. Agricultural Water Management, 203, 366-375.